I'm always fascinated by the design jiu-jitsu performed when a product takes an old negative and turns it into a new positive. (Previously I covered Stain Stamp Mugs, where coffee stains shape themselves into attractive designs on the table.) 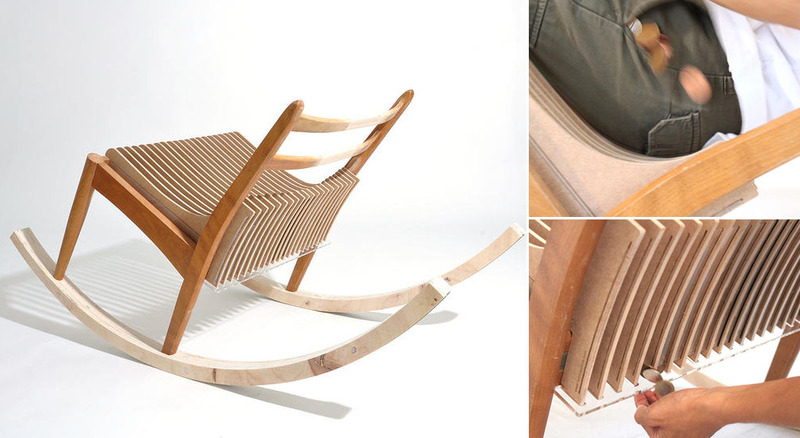 Here's something a little sneakier, but no less clever: the Artful Dodger rocking chair is designed to steal all the change that falls from your pockets when you're sitting. No need to dig around in the cushions either, because the change is conveniently collected in a dispenser area in the back. 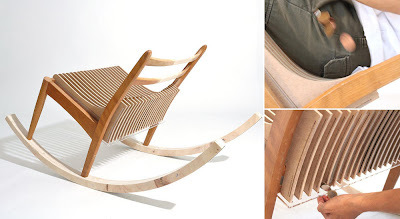 And if the owner of the chair is a nice guy, he'll even give you your change back! 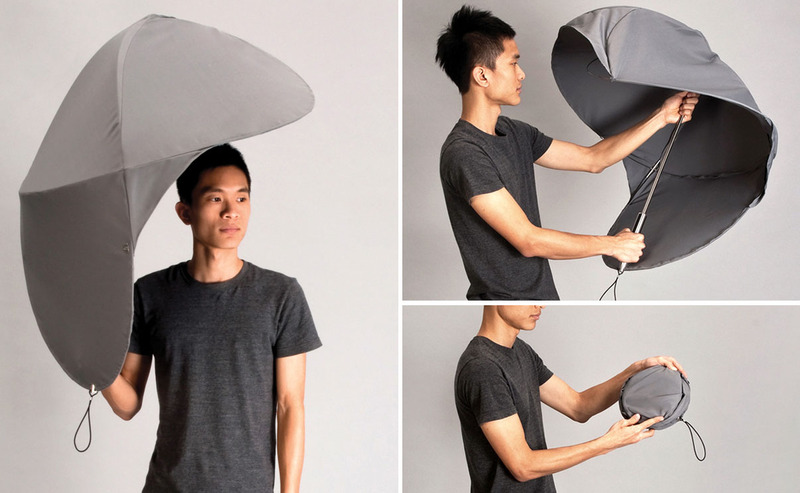 The recent winner of a Red Dot Design Award, the Rain Shield by Lin Min-Wei and Liu Li-Hsiang seems to offer a couple of real improvements over the centuries-old standard design. That generous side panel protects against wind-blown rain or splashes from cars hitting puddles, or could help protect something else you're carrying. The structure seems more robust than a normal umbrella, using bent flexible tubes instead of flimsy hinged metal ribs - a stiff wind might twist this around, but you sense that it would just bend right back. And they didn't ignore practicality when it comes to storage, either - it wraps up into a slim disc that would fit better in a work bag than a stocky cylinder. Sure, there are probably a couple of catches that won't be found until this hits the market - but I'd give it a shot! With all the attention paid to interface buttons (especially by this blog, and even in its title), the good ol' clothing button must feel a bit neglected! But there's room for innovation even in the latter, as shown by Shapeways designer Egant and the clever-but-generically-named Button 2.0. A simple clip holds your headphone cord, keeping it in place during use and letting it hang close by otherwise. Admittedly, one could ask if it's worth it to sew one of these on every shirt you own, whether it'd match the other buttons well enough, and whether this feature should instead be designed into the headphone cord itself. But shhh, don't let the shirt button hear you - it deserves its day in the sun, for once in a long while!